As much as people love the expansive video games of Bethesda Softworks, they loathe the bugs—and the surprising preponderance of them that appear with the launch of new Elder Scrolls or Fallout games. This time, as Bethesda prepares to put out the massive Skyrim, they've got a plan to do better. With Skyrim, Bethesda will adopt a special direct connection to their game—on PC, PlayStation 3 and Xbox 360—that will let them update the game on the fly, similarly to how EA is able to tweak the rosters of their sports games without going through the standard multi-day or multi-week waits to update most games on consoles. They are also running new and better processes to catch bugs before the game launches. "We want to be in the position of being able to improve the game, no matter what way that is," Skyrim creative director Todd Howard told me today as he I played the game and peppered him with questions about bugs and other stuff. Howard is well aware of the unrest among gamers who associate the release of Bethesda's massive, dynamic role-playing games not only with fun, but also with bugs that lock up quests, crash the game, or mangle characters into unrecognizable forms. "It's a known issue and a very valid complaint," he said. Before launch, Howard said, Bethesda is testing Skyrim rigorously and more heavily using a system that runs automated versions of the game overnight, searching for bugs and helping the team squash them. "We're getting better at it," Howard said. They are also adopting this new EA Sports-style "live update" system that will let Bethesda tweak the data in their game almost immediately. If a quest isn't triggering because players are doing some unforeseen combination of actions, that might be addressable by tweaking the data tables that dictate the flow of events in the game. If the game is proving to be unbalanced in an unexpected way, that can be fixed on the fly too. And these fixes—Howard prefers to call them "improvements"— will take effect fast. "We can change stats on a sword and it will be available to everyone in a few hours," he said. Howard didn't want to get too specific about which kinds of bugs he thinks are data-oriented and which are not. It's only those former that the live update server can address, which means that crash bugs will probably still have to be patched in traditional, slower ways. The old ways involved about a two-week minimum turnaround time, Howard said. He's happy that that is no longer the only option. But diligent as Bethesda may be, burned by its own ambition and relative lack of testing, they make massive games full of unpredictable events. Random stuff happens. People can go anywhere, killing, chatting, looting, and defying any direction the game's creators put in the game. That's the point of a Bethesda game and why people like them. But that's also why they are prone to bugs, blemishes and other fun-ruining vermin. Howard is proud to say that Skyrim is a whole lot bigger than his last game, Fallout 3, but he knows what comes with that. "Are there going to be bugs we didn't catch in a game of this size?" he asked rhetorically. "Our assumption is there are going to be." 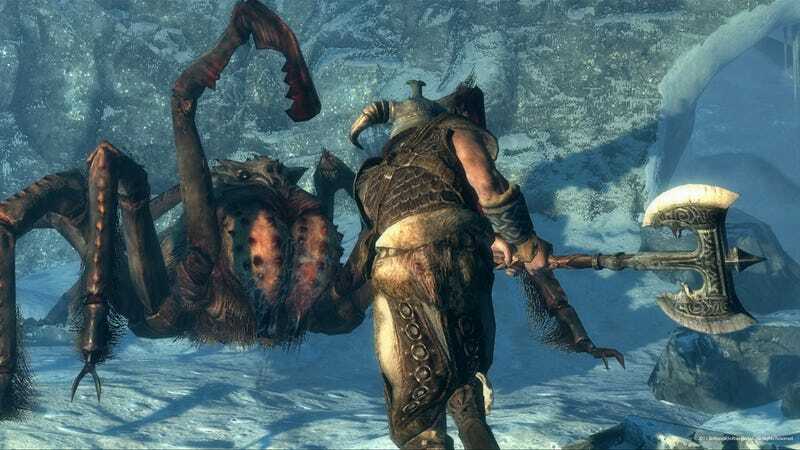 Skyrim fans will surely hope that Bethesda's new systems will more briskly stamp them out.